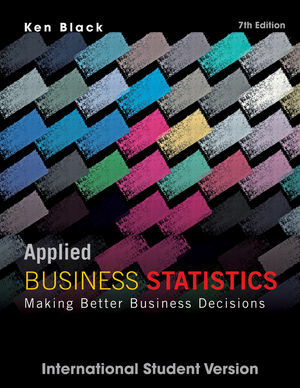 Black, Applied Business Statistics 7e is designed with one goal: to support student success in the Business Stats course. From the clear instruction, thorough explanations and real-data examples, the book is a pedagogically sound, reliable resource for students. With WileyPLUS online learning environment, which gives students a roadmap to personalized instruction by telling them what to do, how to do it and if they did it right, students have more ways to succeed with Black, Applied Business Statistics 7e than ever before. Ken Black is currently Professor of Decision Sciences in the School of Business and Public Administration at the University of Houston-Clear Lake. Born in Cambridge, Massachusetts and raised in Missouri, he earned a Bachelor's degree in mathematics from Graceland College, a Master's degree in math education from the University of Texas at El Paso, a Ph.D. in business administration in management science, and a Ph.D. in educational research from the University of North Texas. Since joining the faculty in 1979, Professor Black has taught all levels of statistics courses, forecasting, management science, market research, and production/operations management. He published fifteen journal articles and over twenty professional papers, as well as two textbooks: Business Statistics: An Introductory Course and Business Statistics: Contemporary Decision Making. Black has consulted for many different companies, including Aetna, City of Houston, NYLCare, At&T, Johnson Space Center, Southwest Information resource, Connect Corporation, and Eagle Engineering. • NEW Thinking Critically about Business Statistics: This new feature provides thought-provoking questions to promote application and analysis of business statistics principles. • NEW and Improved Visuals: Graphs, tables, and figures have been added throughout the text to illustrate and underscore concepts. • NEW Cases: New, current and relevant businesses are profiled to help students connect real organizations with business statistics concepts. • WileyPLUS: WileyPLUS Version 5 online learning environment features all end-of-chapter problems, 22 author video tutorials, databases, applets and more. • Decision Dilemma & Decision Dilemma Solved: Chapter-opening vignettes are brief business-world scenarios which use the techniques introduced in the chapter to solve a business decision dilemma; at the end of chapters, dilemmas are addressed to reinforce the chapter concept. • Ethical Considerations: A feature in each chapter, Ethical Considerations integrate the topic of ethics with applications of business statistics. • Tree Taxonomy Diagrams: Further illustrate the connection between topics and techniques and the ability to see the big picture of inferential statistics.